‘I’m a painter first and foremost’ are the words of one of the twentieth century’s most influential architects in Colin Bisset’s fascinating new novel, ‘Loving Le Corbusier’. Le Corbusier (1887-1965), born Charles-Edouard Jeanneret-Gris, was a Swiss-French architect who pioneered the International School and became an architect of world-wide renown. 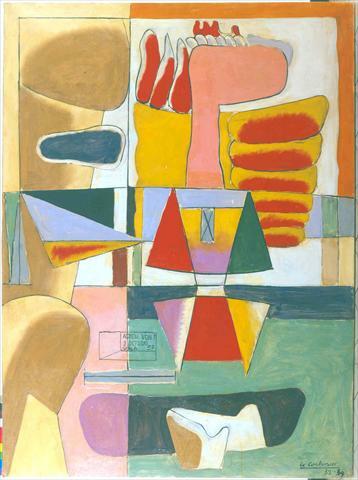 Le Corbusier was intensely creative. Not only an architect, he was also a lithographer, sculptor, designer, theorist, writer and … painter. ‘He seemed calmer when he was painting and he was cheered when the Tate in London bought one of his pictures.’ Bisset continues. 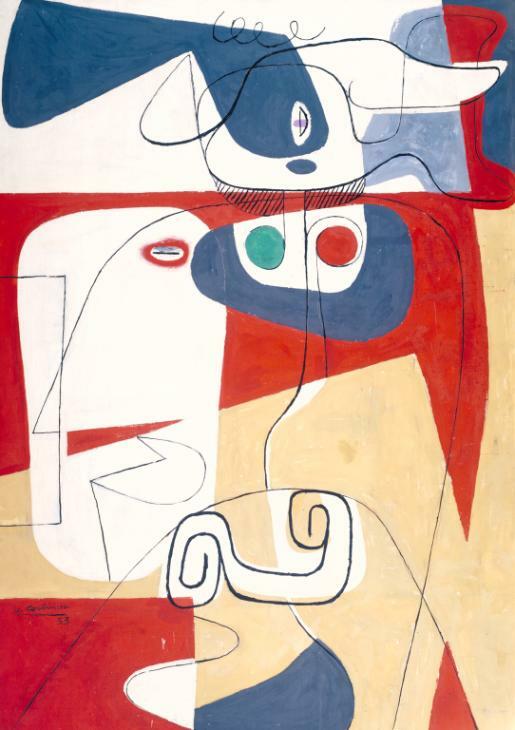 This painting was created by Le Corbusier in memory of his beloved wife, ‘Von’, who died the same year. Bisset’s words made me think of my father – he was an an architect painter too. He had a studio at the top of the house and I was allowed in there to paint with him provided I did not disturb him and washed my brushes afterwards. It was a still, quiet place and I loved it. I think this is why I am a painter today. I remember vividly living with the ups and downs of being an architect in the Britain of the 1970s. My father’s partnership, Renton Howard Wood Levine, could go from over 200 staff to under 20 during a building recession. And there were the constant trials of trying to build the building he had designed – there were the planners, the engineers and, of course, the needs of the client to contend with. But above all, it was the intense complication and difficulty of creating a work of art in which people were going to carry on their daily lives. This is what makes architecture the most difficult art form of all. Is this why architects paint – the simplicity? With painting there is just you, the canvas, the brushes and the colour. Painting is where architects can create directly, with no one to interfere or influence. This is one of my father’s paintings. I like to think Le Corbusier would have approved. What a lovely post (and not just for the obvious reason – thank you). I remember walking to Rue Jacob for the first time and being astonished to pass a small gallery in Rue de Seine which was filled with works by Le Corbusier, including a small sculpture. That’s such a lovely image of you painting alongside your father – a case of nurture and nature working hand-in-hand. And I think you’re absolutely right – I think Monsieur would definitely approve of your father’s painting. Well, Colin, I so enjoyed your book that I had to share it and I thought Le Corbusier and his love of painting was a good way to do this. He was a creative to his bones wasn’t he. Which is probably what made him not the easiest of people to live with. Lovely post – that first painting is much more playful than I imagined him to be. Great memories of your Dad I identify very strongly although my experience was of going into my father’s study. That feeling of quiet concentration was very alluring. Lovely painting by your Dad much more colourful than I would have expected! How old was he when he painted it? I think that’s a great description – quiet concentration being very alluring. I wanted to be in that space. 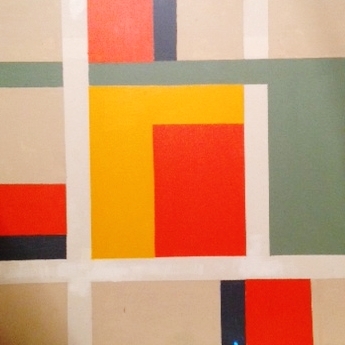 Dad painted quite a few of these geometric paintings towards the end of his life. He would have been 79 when he painted this one. I felt he was travelling back to his youth with these compositions. Fascinating post Francesca – what I love most was the picture you built of your father and your memories of painting in his studio. Dear Francesca, this is wonderful. Congrats! A very interesting look at Le Corbusier. Thank you for sharing the handsome painting by your father. Thank you for visiting and commenting – it means a lot.